Have you thought about your something blue? It's such a fun way to incorporate a pop of personality into your wedding. A lot of people hide their something blue -- blue thread stitching your wedding date into the bottom of your dress, blue on your garter belt like I had (which was also my something borrowed) -- but some people go bold. Be the bold. Especially if you like Doctor Who. The show is so popular right now, so I know a lot of people who want to incorporate it into their wedding. But maybe you don't want a full Doctor Who-themed wedding. I get it. But you should go ahead and use Doctor Who for your something blue. It's fun and easy. I mean, the Tardis is blue. That basically covers you. 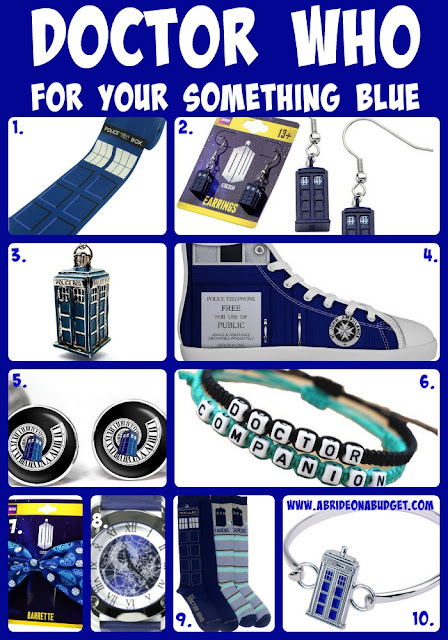 I did go through the Internet and found my favorite ideas to use Doctor Who for your something blue. Check out my list below. Just a quick aside: I put together this list because I know a lot of people who love Doctor Who. I'm not affiliated with Doctor Who at all. BRIDAL BABBLE: Which Doctor Who item would you pick for your something blue?